I’m Edward and I’m a third year studying Mathematics. As the JCR Computing and Website Officer, I’m responsible for maintaining the JCR website and assisting the JCR committee with any computer-related tasks they have. I serve as the JCR representative on the College’s Computing Committee, which meets once a term. 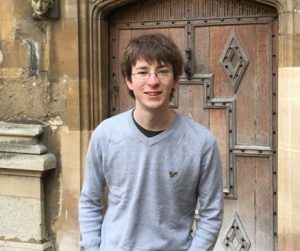 Feel free to email me at edward.hart@ccc.ox.ac.uk or talk to me at JCR tea if you have any problems with the JCR websites or have concerns about the College’s IT provisions. I’m also the President of the University Computer Society.